The train pulled out of Union Station at 11:30 a.m. on the Saturday of Memorial Day weekend and by the time we got to the next station at New Carrollton, rain was streaking across the windows. I hoped it would be a passing squall or we’d travel past it because we were planning a busy twenty-six-hour trip to New York City—a belated birthday present for June— and for a lot of that time we’d be outside on a boat, in a horse-drawn carriage, or walking from place to place. I needn’t have worried. The rain cleared quickly and we didn’t see another drop until we were on another train, heading south the next day. 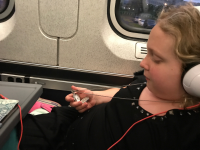 We passed the train ride reading books and magazines, listening to music and podcasts and playing games on the IPad. June talked me into buying her a Gatorade and the world’s most expensive Twix bar ($3!) at the café car. June must have noticed me leaning forward a little in my seat to see Boathouse Row and the zoo and the Philadelphia Museum of Art as we passed through my home town. “Philadelphia,” I said a little sadly, because I haven’t been there in several years, since my mom moved to Oregon. We got off the train around 3:45 and walked to our hotel. Beth had reserved a room with two queen beds but for some reason we’d been upgraded to two separate rooms with a king bed apiece. The kids don’t like to sleep in the same bed, so Beth was rooming with June and I was with Noah. When her act was over, she came over to our table, where June was drinking a virgin mojito and Noah had a soda. Michelle hadn’t seen Noah since he was three and she’d never met June, so they got acquainted and she and Beth started to catch up about family and friends from home, a conversation that unspooled throughout the rest of the afternoon and evening. While June was in the bathroom, Michelle asked why she was walking with a cane, and we filled her in on June’s year of injuries—some of which I haven’t even chronicled here. Did I mention the dislocated finger? Or the elbow injury? 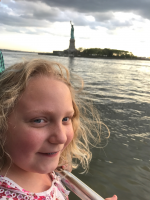 I don’t think so, but if you looked carefully at the picture on Noah’s birthday blog post, you may have noticed June’s arm was in a sling. As if to drive all this home, on a subsequent visit to the restroom (the Gatorade June drank on the train was a very big one), Michelle was the first witness to a new injury as she crossed paths with a tearful June who had just slammed her fingers in the restroom door. Michelle fetched some ice from the bartender and we proceeded from the pub to a drug store for painkiller. For much of the evening, I was carrying the ice in a plastic baggie and leaving a trail of water drops everywhere I went. Next up was dinner. June wanted New York pizza and Michelle had a restaurant in mind, but we were in the theater district and it was around five so there was a long line of theater goers who wanted an early dinner and the greeter predicted an hour wait. We left, found a promising hole in the wall with no line, but by this time June had to go to the bathroom again and they didn’t have one, so we found a Starbucks, used the facilities there and stopped at the next pizza place. Fortunately, they weren’t in short supply. This one had a sign saying the restroom was out of order, and as we were trying to decide whether June could stay long enough to get some pizza and eat it, the proprietor said we could use the bathroom after all. (The toilet didn’t flush but it looked like this state of affairs was a very recent development, so we made do.) We got two kinds of greasy pizza, vegetable Stromboli, garlic knots, and mozzarella sticks. It was very satisfying. Thanks for your intrepid pizza-finding skills, Michelle! From there we walked to the water, because we were taking a sunset cruise on the Hudson and East rivers. 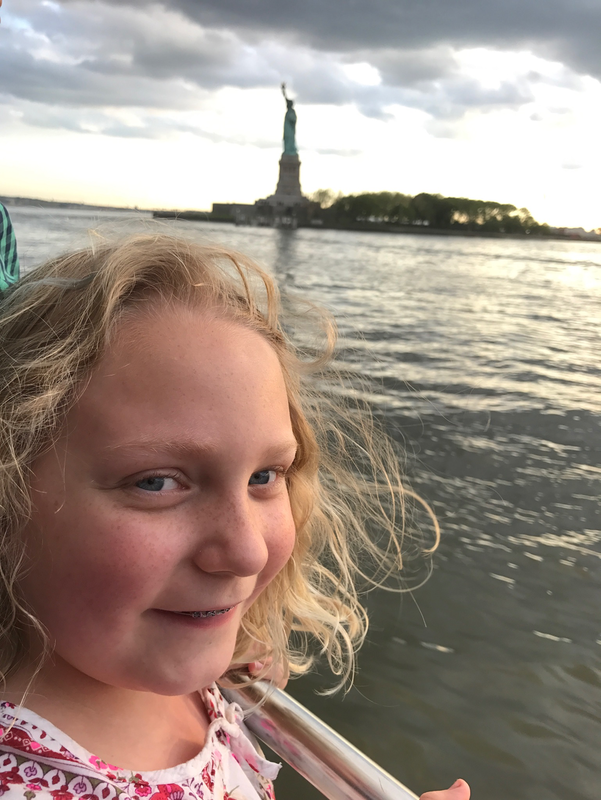 We saw the Statue of Liberty, Ellis Island, the Brooklyn, Manhattan, and Williamsburg bridges, the Empire State Building lit up in red, white, and blue for Memorial Day and many other sights. June, Michelle, and Beth were out on the deck most of the time, while Noah and I stayed inside. The view was good from there and I could hear the narration better. When we were at the Statue of Liberty, the tour guide read Emma Lazarus’s poem, “The New Colossus”— you know, the one with the lines: “Give me your tired, your poor, your huddled masses yearning to breathe free.” He read the whole thing and I was glad of it because I’ve always been fond of that poem and it seems particularly relevant now. Near the end of the cruise, I joined June out on the deck and Beth and Michelle went inside. I asked June if she was cold in her thin cotton dress (because I was cold in a turtleneck) and she said no. We said goodnight to Michelle at her subway stop and walked back to the hotel, where we crashed, well past everyone’s bedtime. We had breakfast at a hotel restaurant several blocks away. We’d picked it because June wanted pancakes and they were on the menu, but we’d missed the detail that they were on the weekday breakfast menu and not the weekend brunch menu. She chose doughnuts instead and didn’t like them because they were more like cream puffs filled with cannoli cream. There were three of the offending pastries and Beth, Noah, and I took care of eating them for her, while Beth gave June half her berry-covered waffles and everyone was happy. (I had a mushroom omelet and a salad.) Noah had to write a restaurant review for his journalism class and he’d decided to review this one so we kept giving him suggestions about what to say about it. 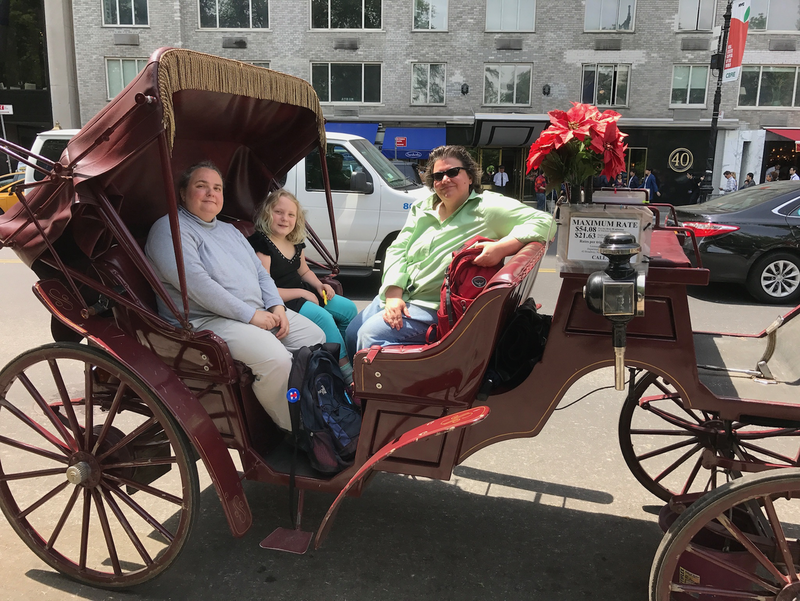 June’s next agenda item was a carriage ride in Central Park. Noah asked if he could go back to the hotel instead and we let him, because he seemed to need some alone time. Beth gave him directions on how to get to the Broadway theater where we were going to see a show and we decided to trust he’d find his way there. The play was fun. 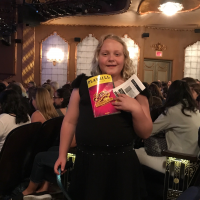 I’d expected June to choose Cats, as it’s the only show currently on Broadway her musical drama camp has tackled and I thought she might like to see a professional sing her solo from “Memory,” but she went with Charlie and the Chocolate Factory instead. I guess that’s not surprising as both kids were quite fond of the book when they were younger. I liked the set for the first act, which mainly takes place in the Buckets’ tumble-down house, with the bed the four grandparents share elevated high above the rest of the house and tilted slightly forward, which gives you a good view of the actors and makes it seem like it might collapse at any moment. The second act sets, in the factory, were kind of minimalist for what’s supposed to be a place of exuberant wonders. The best one was the meadow made of candy where Augustus Gloop falls into the lake, but it takes up a surprisingly small portion of the stage. And speaking of Augustus, I thought the German stereotypes in his portrayal went overboard and this ethnic and racial stereotyping was evident in most of the kid characters (who, except Charlie were all played by adults). There were some clever updates, with Mike Teavee being a hacker obsessed with all screens and not just television, and Violet Beauregard being a social media celebrity. The Oompa Loompas were imaginatively portrayed by kneeling actors with puppet bodies hanging from their heads. Their colonialist back story is still in there, but you have to lay the blame for that on Road Dahl. I also liked the spooky squirrels in the nut room. They’re huge and have red eyes. It’s a ballet scene so Beth thought they were supposed to evoke the Rat King from the Nutcracker. As for the acting, the boy who played Charlie was good—and I liked the way the script made him a more well-rounded character than in the book. (It’s always bothered me that Charlie inherits the factory merely for not misbehaving, but this production gives him more motivation.) Ms. Teavee was also more well developed than in the book and I liked her character. The actor who played Willy Wonka was fine, but he wasn’t Gene Wilder. That’s all I have to say about that. Overall, we enjoyed the show and we also got some overpriced candy during intermission because how could you not? We had a little time to kill before the train, so we window shopped a bit. June had already gotten a smiley face fidget spinner as her one promised souvenir but she wanted to buy another one with her own money. She tried on a baseball hat that said New York in rhinestones and looked at a lot of New York magnets, but she went with a pocket watch she found in a warren of booths near the theater. Once she’d made her purchase, we walked to Penn Station, bought some food to eat on the train and said goodbye to New York until our next visit. This entry was posted in Travel by Steph. Bookmark the permalink.